Cork won the All-Ireland Intermediate Camogie title at the third attempt with a seven-point defeat of Down. The Leesiders recovered from a poor start to overpower a battling Down side by 1-13 to 0-9 at Croke Park. Catriona Collins' decisive second-half goal finally broke the Down resistance and the Munster side powered clear. Cork, who finished runners-up in the previous two years, ended a 12-year gap since their last Intermediate win but Down's 20-year wait continues. 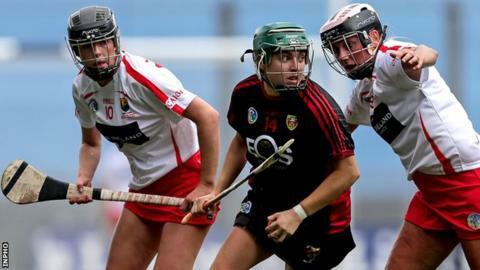 The Ulster champions were making their first All-Ireland final appearance since their only Intermediate success in 1998 but they made a composed start against their more heavily-favoured opponents. Led by inspirational full-forward Niamh Mallon, Down were fastest out of the blocks with a high-energy pressing game that yielded a three-point lead by the 16th minute. But Cork reeled-off five unanswered points, including three-in-a-row from Collins, to lead by 0-7 to 0-5 at half time. Once again, Down started the second half strongly as Mallon and Saoirse Sands fired over points to level the scores. Collins responded with a couple of settling frees to restore Cork's cushion before the corner-forward got the decisive score of the game. Centre-forward Finola Neville was given the space to run at the Down backline before handpassing to Collins, who caught and swivelled in one movement before planting her shot past Maria McNally for the only goal. Down attempted to respond but their hopes of an upset faded when Sara-Louise Carr was sent off for a second bookable offence and the out-standing Saoirse McCarthy fired over a long-range point just seconds later to hammer home their superiority. Cork: A Lee; L Weste, S Harrington (capt), N Ni Chaoimh; S Hutchinson, J Barry, L Callanan; S Buckley, K Hickey; L Hayes, F Neville, S McCarthy; C Sugure, M McCarthy, C Collins. Replacements: S Beausang, R O'Callaghan, K McCarthy, C Healy, R Killeen, K McCarthy ,M Barrett, R O'Shea, K Wall, C McCarthy, E Hurley, R Keane, K Cullinan, M Lynch, K Barry. Down: M McNally; C McGilligan, A Savage, N Kelly; B Savage, F Carr (capt), D Magee; C Rocks, P Gribben; D Savage, A McAleenan, SL Carr; S Sands, N Mallon, O Caldwell. Replacements: O Gribben, M Higgins, L Wilson, C O'Hare, C Cowan, E Rushe, C McCartan, B Fitzpatrick, K McGilligan, C Fitzpatrick.